Back cover blurb: She’s watching you, but who’s watching her? Lily Gullick lives with her husband Aiden in a new-build flat opposite an estate which has been marked for demolition. A keen birdwatcher, she can’t help spying on her neighbours. Until one day Lily sees something suspicious through her binoculars and soon her elderly neighbour Jean is found dead. Lily, intrigued by the social divide in her local area as it becomes increasingly gentrified, knows that she has to act. But her interference is not going unnoticed, and as she starts to get close to the truth, her own life comes under threat. But can Lily really trust everything she sees? 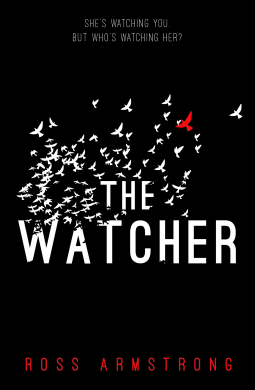 The Watcher is a novel that I can only describe as a little strange - but in a good (and very intriguing) way if that makes sense? Lily seems to be an odd woman from this novels outset, she appears to be slightly unhinged, but it is not clear at first whether this is the case or not. Living in an apartment block Lily is able to view the comings and goings of all of her neighbours, and as a former bird watcher has the skills to do this largely incognito. When Lily witnesses something disturbing she is unsure what she should do. So she begins to write in a journal, which we later discover is sent to her Father. One night when Lily is unable to sleep she stumbles across an elderly ladies apartment and befriends the older woman. When the woman is found dead the next morning, Lily is naturally the prime suspect. Lily knows that she isn't responsible for the murder, and is determined to find out who is and she will stop at nothing until she does. Even if it means putting her own life in danger. The Watcher does read slightly oddly at times (this could just be me..! ), but it is an enjoyable book, and definitely one to "watch" if you are looking for something a little different. I look forward to more from this author. The Watcher is available now via Amazon online and all good book shops.